This is not a full-sized book. It is a pocket-sized booklet of 35 pages. 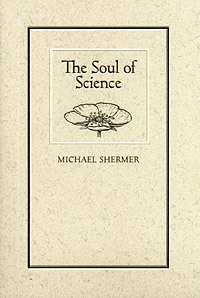 The Soul of Science is Michael Shermer’s brief statement of belief on science, the soul, and the afterlife, from a scientist’s perspective, and how we can find meaning in life even (and especially) without the promise of a life beyond this life. Mr. Shermer, I was just wondering if you could clear up something scientific for me. In the 2nd-to-last comment in the website I put as my link, the commenter talks about “the distinction between proving something doesn’t exist and not proving that something exists.” Could you please explain this concept to me? I can’t seem to wrap my mind around it. This seems like solipsism; after all, our DNA sets up the human essence or soul of our children. To deny this is to deny our own heritage back to the genetic Adam and Eve, and back to the earliest lifeforms on Earth that were based on DNA. True, our *specific* DNA sequence has a finite lifetime, but would it not be proper to think of ourselves as part of something greater and grander than a quest for personal immortality? Mutation with selection is our solution to the problem of long term adaptation, and some may even believe that the gradual increase in complexity and self-awareness also has a purpose.